As you open the door to the road and descend down the steps into the waterfront cliffside, you realize you are about to experience something truly special... and 100% unique. Breathtaking views of the ocean, the US and British Virgin Islands on one side and a cliffside pool and huge rock grotto/cave on the other, Mango Tango has been a long loved home for sunbathers, energy bathers and all who just want to recharge, heal or just reconnect in the perfect setting. Complete privacy and all the best of Caribbean Ocean air, billion year old stone and tropical foilage all combine for the perfect getaway in this Virgin Islands eco-retreat. Perfect for couples and families who want their own private slice of heaven to get away from it all. Pictures don't do this place justice. We took over this very popular vacation rental property a few years ago and remodeled it from top to bottom as our personal home. Adding solar panels, chemical free pool filtration, enhancing the landscape and blending the home to the environment, we came to know Mango Tango as our own personal Garden of Eden. We are living in the States now and using it as our own vacation retreat and are happy to share with you the magic of Mango Tango. As a nature retreat, the house is painted to blend in with the Ocean and tropical foilage in unique carefully planned ways. The end result is you feel all the comforts of home within the exact feeling and energies of an almost unaltered natural environment. The grotto is amazing for yoga, meditation or just relaxing with a cocktail. The outdoor shower offers complete privacy and ocean views and botanical surroundings. Magen's Bay Beach, one of the world's top beaches is only minutes away if you can bring yourself to leave this paradise. I am a serial entrepreneur, a mediocre tennis player, a yachting enthusiast and am constantly in awe that God let me have such an amazing wife and new daughter. We first came to the Virgin Islands in 2010 so that I could propose to my wife, returned the next year several times to get married in St. Croix and then decided to move to St. Thomas in early 2013. We found Villa Mango Tango in 2014 after looking for a home for over a year. When going for viewing my wife had made up her mind to buy the house while descending the stairs into the property - before we could even see the house. There is an energy there and a uniqueness that can only be experienced. After a couple of magical years living there in our own Garden of Eden we had to move back to the states to prepare for our daughter's birth. We now use it as our own vacation destination and are happy to share it with you. At the time we purchased it, Mango Tango was a very successful vacation rental that had earned 53 reviews and 100% of them were 5 stars. I'm hoping to build that reputation back as we are starting over. In us, you'll find in us an unusual willingness to help. We were once you, coming to the island and not knowing where to go and what to do and what means what. Small lessons learned make a big difference in your vacation and we'll be happy to help accommodate any need or wish. When you open the door from the road and begin to descend down the stairs to this Completely Private Oceanfront Eco-Retreat you will know you are in a very special place. You will feel the energy instantly. Billion year old boulders, the ocean breezes and views I never knew could exist combine for an energetic experience that you'll never forget. It is truly a Heaven on Earth that you won't want to leave for the day, much less at the end of your vacation. The villa is air conditioned. Each room has temperature controls for personal comfort of each room. Possible, please ask well in advance. The property has many stairs and is not in any way handicap accessible. We had a wonderful time - the views from the house are just incredible! The house is clean, and well maintained. The AC in the master bedroom was not working, which was not ideal, and the lights in the pool were also not working. Those are easily fixed, and having them work would make the house fire on all cylinders. The sound of the waves on the rocks is simply mesmerizing, and the house is not wanting for any accoutrements. Brandon was very responsive and helpful, and it would be great if the house came with a bit more detail about top beaches, restaurants, hidden gems etc. Far better directions to find the house, with detailed driving directions, with many landmarks should be provided. The property keeper met us and showed us around the property. The house was immaculate with amazing views of the ocean. Quiet and peaceful and overall just an amazing stay! Mango Tango felt like a second home. It is very comfortable, clean, beautiful, and dream-like. I HIGHLY recommend this gorgeous villa to anyone looking to stay in the Virgin Islands! You are constantly surrounded by amazing scenery and views and you will hardly want to leave to enjoy other parts of the island because you will be enjoying it all at the villa. Pictures just don't do the villa enough justice! It is far more beautiful than what you see in the pictures!! This is a home that I will definitely rent out again! My wife and I stayed at the Mango Tango Villa from 5/6-5/13 2014. The views were spectacular. The sunrise greeted us every morning for breakfast. The villa has constant ocean breezes which keeps you at the right temperature. 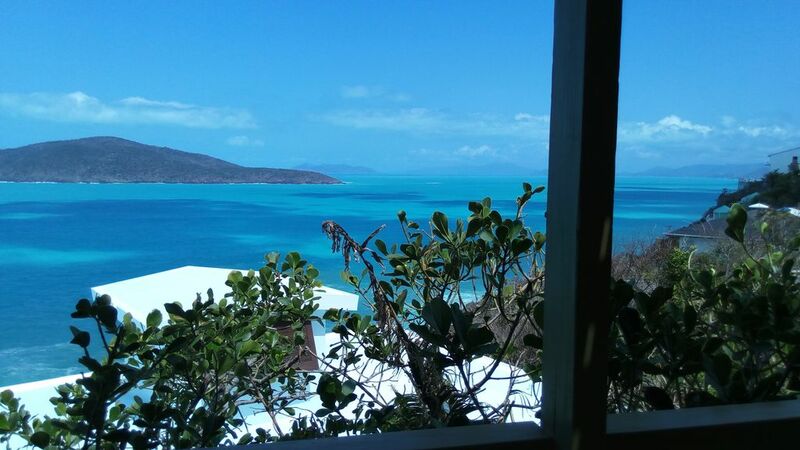 The views of Hans Lolick and the BVI were beautiful. The pool and grotto were relaxing areas to hang out. The entire house was nicely decorated, and the WiFi was a big plus. Kitchen was nicely equipped. The stair case from the road to the villa could be a challenge for those with bad knees, but overall, it added to the ambiance and charm of the villa. Would definitely recommend it for a romantic getaway. We had a wonderful week spent in this beautiful home on St. Thomas. The house is beautifully decorated and has everything you need. We spent every morning watching the sunrise and listening to the ocean as we drank our coffee. The pool is a great place to spend a lazy day or come back to at night after seeing the sites. I would love to spend another vacation here!